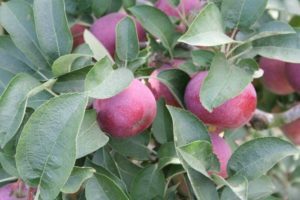 Terhune Orchards grows more than two dozen varieties of apples, and a dozen of those are available for pick-your-own from September to November. Our apples are crisp and have a nice “snap” when you bite into them-sweet or tart, red, yellow or green- we have something for everyone. Apples are available in the farm store all year long thanks to our cold storage facility, which keeps our apples crisp and fresh. Crunchy and juicy, our apples are perfect for snacks, lunchboxes and pies, and we have plenty of the all-American fruit to choose from at Terhune Orchards. Picking your own apples at our farm is one of the pleasures of fall. Our Van Kirk Road Farm is open for apple picking every day in the fall, with wagon rides to the picking on the weekends. You can also find gourds at our Van Kirk farm to dress up your fall holiday arrangements. Apples are one of the easiest fruits to pick; it doesn’t take much time to fill a basket with the freshest possible fruit. Terhune’s dwarf apple trees produce plenty of fruit within easy reach of even the smallest hands. To pick an apple, use your whole hand to roll it upwards off the branch, then give it a little twist. Don’t pull it straight away from the tree because that might damage the branch and shake other apples to the ground. Terhune workers are always available to explain which apples are ready for picking and the correct way to harvest the juiciest, sweetest apples. Our Van Kirk Road orchard is open every day and on weekends, we offer wagon rides through the orchards to where the ripe fruit is waiting. Varieties available at Terhune begin in September and finish in November. We have gala, Fuji, Granny Smith, Braeburn, Stayman Winesap and more!